A busy week of negotiations and analysis of tax policy this week, ahead of the Christmas holiday. Congress will not be avoiding the Christmas rush this year, and a vote on a compromise bill is expected this week. A cut in the corporate tax to 21 percent from 35 percent is significant, and improves the after-tax earnings outlook. A reduced top individual income-tax rate, to 37 percent from 39.6 percent, should bolster private demand and savings. 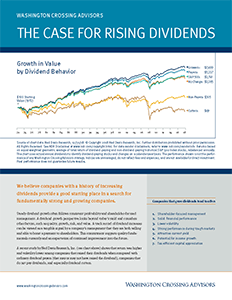 Progress on the tax front is important given the nearly $5 trillion increase in U.S. market value this year. Meanwhile, monetary policy continued to move toward less accommodation last week. The Federal Reserve raised rates by 0.25% in a widely anticipated move, and Janet Yellen signaled continued progress for the economy. Very little new news came out of the Chair’s last press conference or the FOMC outlook. What is clear to us, is that 2018 is starting with a different policy backdrop than recent years. The combination of a deficit-financed fiscal push and reduced monetary accommodation is a unique policy cocktail, especially this late in the cycle. Apart from policy shifts, the various signals we monitor continue to point to growth and healthy investor appetite for risk. 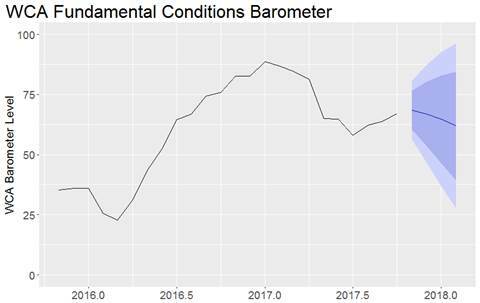 As you can see below, the WCA Fundamental Conditions Barometer (below) remains above 50. Our forecast path centers around a 65 reading for the next three months, supporting a more bullish portfolio mix. 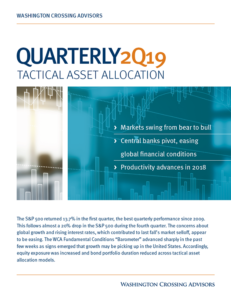 Accordingly, we remain overweight stocks and underweight bonds in the CONQUEST tactical asset allocation portfolios.